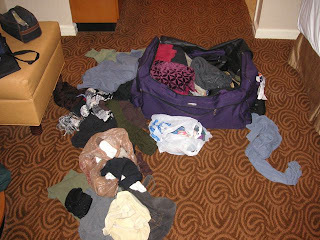 Unpacking and re-packing to leave the hotel, I did an itemization. I don’t like being obligated in the present to say what I will want in the future. It could change. I prefer to decide at the last possible minute—but the consequence is that I am must then carry my choices with me. If you can’t commit, you can’t jettison—and I fear this extra weight slows me down, in my life as well as my travels. I too don’t like to be limited when it comes to clothing choices and always over pack. However, I still seem to pack less than some people. I think that’s because I generally bring only one or two pairs of jeans to go with everything.